This large nightstand made the perfect addition to our bedroom. I paid extra for the "White Glove" delivery and was glad that I did. The delivery people unpacked the nightstand and gently placed them exactly where I wanted them. (good thing, these nightstands are heavy and would be very difficult to move with only 1 person). The nightstands are very good quality for the money and the dark wood really makes them look nice. 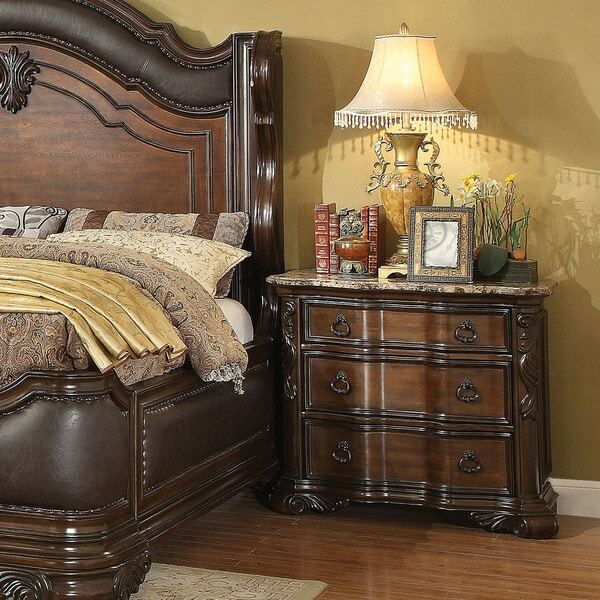 Elevate the sophistication of your bedroom's decor with this traditional Huston nightstand from Furniture of America. The nightstand has a gorgeous bowed-out design that will make it an instant classic in your home. The top drawer is lined in felt to protect your valuables from scratches, and the top is made of genuine marble. Dimensions 35.75 In. X 19.0 In. X 31.75 In. The night stands are very nice with good quality wood. I actually wasn’t expecting them to be of high quality and they were. I’m so glad I made this purchase for my master bedroom! The best purchase hands down and i can’t wait to add additional pieces! These night stand are even more stunning in-person! They came packaged with adequate wrapping and filling to avoid damage. The drawers close smoothly and the amount of storage is impressive. As beautiful as this piece is, I regret purchasing it. I’m a busy mother of 3 toddlers and working full time so I kept procrastinating on figuring out what was the issue with the bottom drawer not closing completely. Just today, I finally get in to see the back of the drawer with a flashlight and a large piece at the end has collapsed. I’m so disappointed. This is definitely poor workmanship and I’ve lost out on being able to return it. These nightstands are beautiful. I ordered 2 of them and get so many compliments. When my furniture arrived, it was torn all to pieces. This is my first and LAST experience with overstock.com. I do NOT recommend it. I have a Ledelle bedroom set and needed the other nightstand this is as close as I can get,When I talked to Ruby He told me He would give me a 6,00 credit and it would appear on the last page I do not see the credit????? "Do you have the dresser or armoire "